Attendees will receive numerous MS Excel worksheets developed by Mr. Huston (that they can use over and over) to create their budget, calculate equipment cost per hour rates, calculate crew rates for their various crews (installation, maintenance, irrigation, tree, irrigation service, etc.). Attendees will receive a free copy of the Bid Board software created by Mr. Huston to track their leads and to track their progress toward their annual budget. Differentiate the six methods of estimating used in the Green Industry today. Train contractors and key staff on how to implement the Strategic Plan as a vital and dynamic management tool. 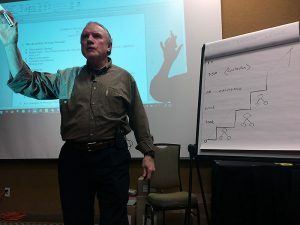 Web-based Seminars offered online via www.gotomeeting.com. You can have all your office staff participate. You’ll receive Microsoft Excel files with all of your webinar information that you can reuse in the future. You will also receive Microsoft Excel files that you can use to bid your work. This webinar is divided into four 90 minute modules. See webinar rates on the latest J. R. Huston Consulting Rate Card. This webinar will combine multiple (no more than five) companies on one call (one participant per company) so that everyone can learn from each others questions and answers. You’ll receive Microsoft Excel files with all of your webinar information that you can reuse in the future. You will also receive Microsoft Excel files that you can use to bid your work. This webinar is divided into four 90 minute modules. See webinar rates on the latest J. R. Huston Consulting Rate Card. *If either of these webinar options does not satisfy the needs of your company or association, please contact us in the office to discuss alternative options.